I’m not sure why chili seems to be one of the most popular foods to serve on Super Bowl Sunday. I suppose in most parts of the country it is very cold out (sending warm thoughts your way Chicago and neighboring cities/states! ), so chili is a perfect cozy dish. And the Super Bowl is a pretty long event, lending itself well to dishes that can stay on the stove or in the slow cooker for hours. Plus, I think any kind of a DIY topping bar situation is great for a party. I guess those are all great reasons! I make chili for the Super Bowl every other year and this is a chili year. I am making two – one vegan and one with turkey. I’ll put out a great topping bar with chips, radishes, onions, cheese, sour cream, avocado, cilantro, and salsa + my husband has to have cornbread with his chili. 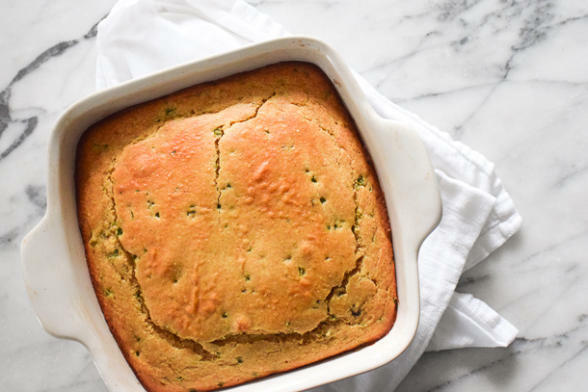 I wanted to make something a little different this year, so I tweaked my standard cornbread recipe with the addition of a roasted poblano pepper and some raw organic cheddar cheese. I may never eat basic cornbread again! This was so, so good. Poblano peppers are considered chili peppers, but on a scale of 1 to 10, they’re about a 1. Roasting them adds the most wonderful smoky flavor and softens them up, too. It doesn’t take much time, and you can do it in advance, so I encourage you not to skip that step. If you don’t want to add cheese, don’t. You can make this completely vegan and/or gluten-free if you want. Or adapt it as you need. The only suggestion I would make is to make it the day of since cornbread is always better when it’s fresh. Fortunately, it takes minutes to pull this together. Another option is to make it today and freeze it when it has cooled. Pull it out of the freezer Sunday morning. 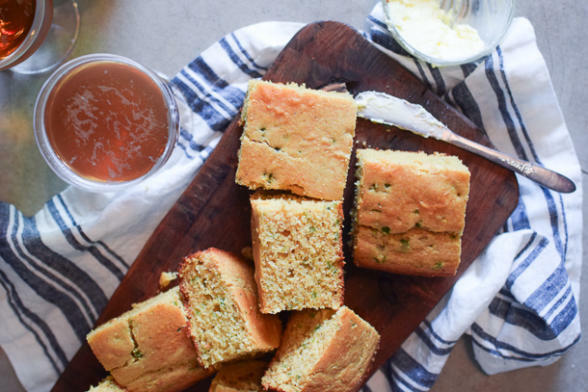 This cornbread is moist and corny and packed with flavor. Leftovers are great the next day toasted and topped with a scrambled or fried egg and leftover salsa. 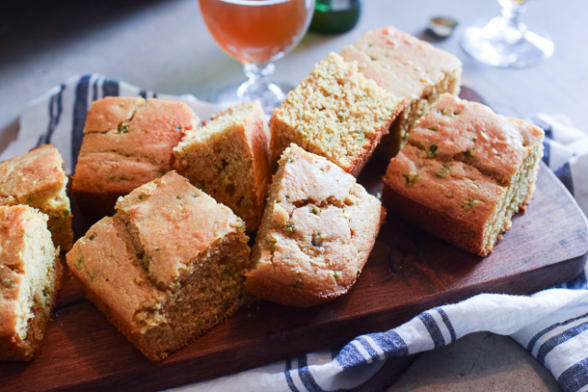 If you like a more tender and less grainy cornbread, there are notes at the bottom of the recipe for what you can do. None of my teams has made it into the Super Bowl in many years, but since LA is in it this year, I’m excited to have a team to root for. I hope you all have a fun day! Thank you for tagging me on Instagram @pamelasalzman #pamelasalzman. I absolutely love seeing your creations! In a large bowl, whisk together the flour, cornmeal, baking powder, baking soda and salt. 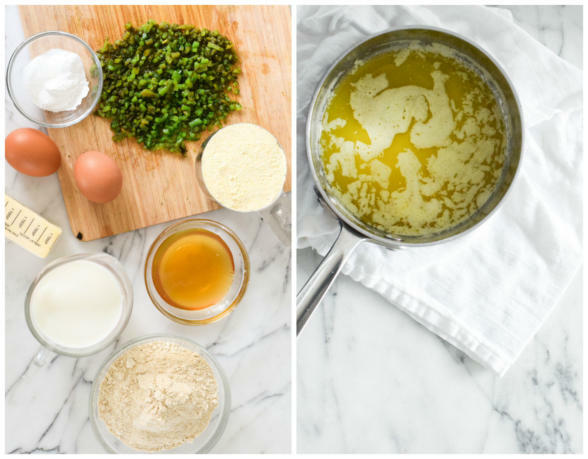 In a medium bowl or a blender, combine buttermilk, melted butter, eggs and honey until well blended. Pour wet ingredients into dry ingredients and stir until just combined. Stir in the poblano pepper. Using an ice cream scooper, divide the batter into the muffin pan or pour it into the prepared pan. Bake the muffins for 15-18 minutes, or until the tops are golden and a toothpick inserted in the center of a muffin comes out clean. Or bake the cornbread in the 8 x 8 pan for 30-35 minutes. Cool for 5 minutes on a wire rack before removing muffins from the pan. ***Or 2 Tablespoons ground flax meal mixed with 6 Tablespoons warm water. Allow to sit 10-15 minutes. And then allow batter to sit 5-10 minutes before baking. 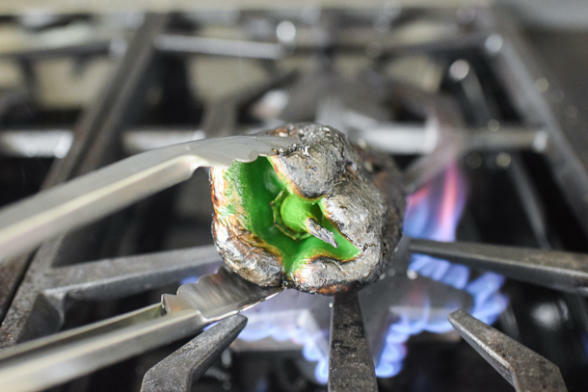 ****Char the poblano pepper over a gas flame or 6 inches under the broiler until just blackened on all sides. Place in a bowl and cover for 15 minutes. Peel, seed and finely chop. This can be done 1-2 days in advance. I went to your website today to search for a different recipe and saw this post. We were planning on catering for our Super Bowl party but once I saw this recipe as well as links for your turkey chili and vegetable chili recipes, I got inspired and wanted to make these recipes instead of catering. I quickly went to the store to get ingredients for a test run. The cornbread and turkey chili turned out so well (so flavorful!)! Thanks for the recipes and inspiration. You are my favorite chef. Yes! That makes me so happy. Homemade food is so much better tasting and better for you. I hope you had a fun day!